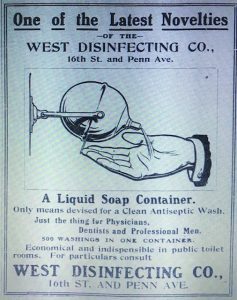 The West Disinfecting Company was an early manufacturer of disinfectants and a pioneer in bathroom/restroom cleanliness. The company held patents for a wide range of disinfectants as well as for items still seen universally in restrooms today such as liquid soap dispensers and paper towel dispensers. This 1909 advertisement showed an early version of their liquid soap dispenser. Their signature cleaning fluid and disinfectant was called Chloro-Naptholeum, or CN for short. It appears that the business had its roots with Robert S. West in the late 1880’s in Cleveland, Ohio. An item in the July, 1888 edition of “Carpentry and Building” indicated that West had introduced Chloro-Naptholeum into the United States at around that time. A disinfecting fluid called chloro-naptholeum said to possess thorough effectiveness as an antiseptic and disinfectant, besides being cheap and having an agreeable smell is being put upon the market by Robert S. West, corner of Elm and Winslow Streets, Cleveland Ohio. From a circular before us we learn that this preparation is already largely used in England and a number of testimonials from those who have used the material abroad are presented. Its power as a germ destroyer is said to exceed that of carbolic acid and other similar antiseptics that are soluble in water. It does not dissolve in water but mixes with it, forming an emulsion like milk. The 1900 census records indicated that Robert S.West was born in England and immigrated to the United States in 1870 at the age of thirteen. He’s listed in the Cleveland directories as early as 1874. Beginning in 1891 and lasting through 1899, the directories listed him as a disinfectant manufacturer with an address of 48 and 50 Long. 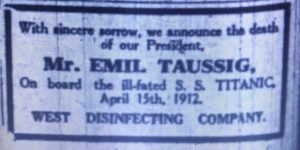 During this period, the New York City firm of E. Taussig & Co. served as West’s representative and general agents on the east coast, using the trade name “West Disinfecting Co.” NYC directories listed E Taussig & Co. at 894 First Avenue (1892 to 1894) and later at 206 East 57th Street (1896 to 1899). 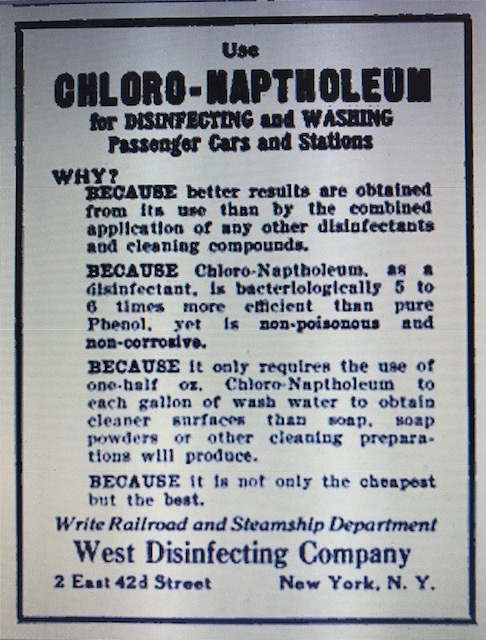 As early as the mid 1890’s, E. Taussig & Co., using the West Disinfecting Company trade name, was advertising Chloro-Naptholeum in connection with a ventilator and disinfector which was apparently one of, if not the first, automated toilet sanitizer. An advertisement, disguised as a news item, in the November 24, 1895 edition of the Atlanta Constitution described how the system worked. West Disinfecting Company, 206 East 57th Street, New York – E. Taussig & Co., Proprietors – Leo Fresh, Manager, Atlanta Ga.
Taussig’s Ventilator and Disinfectors are in use in all the public buildings at the exposition grounds as well as in Atlanta and all the largest exposition houses in New York City, and such as Edison Electric Illuminating Company, all branches, E.S. Jaffray & Co., Cotton Exchange, Masonic Temple, Mount Louis Hospital and many others. Over 35,000 now in use in the United States. Chloro Naptholeum refined is clear as a crystal. Is used in the machines and will drip automatically for twenty-five days with one filling, one minute and twenty seconds between drops. One gallon of the fluid will last 100 days. The machines are put in gratis, and all you have to buy is the fluid, and the inspector will be there every twenty-five days and fill them, thus saving you the trouble. The machines are placed as the cut will show, and are the property of the company. The fluid is $2 in single cans and $1.75 in five and ten gallons, and $1.50 in half-barrel lots. By the late 1890’s Taussig & Co. had assumed control of the entire business. In accordance with an agreement dated August 4, 1898, E Taussig & Co. purchased from Robert West all interest, including patents and trademarks, in both his automatic disinfectors and chloro-naptholeum. Approximately one year later, the West Disinfecting Co., Inc. was established and on July 18, 1899, the Taussig business was transferred to the new corporation. Emil Taussig, served as the first president of the newly formed corporation. It was at the same time that the CN trademark was introduced as well. Trademark records indicate that it was first used in commerce in July, 1899. The new corporation was listed in the 1900 NYC Copartnership and Corporation Directory with offices at 26 East 59th Street in Manhattan. Around this time, the company also established a factory/laboratory across the East River in Queens. The 1903 Trow Business Directory for Brooklyn and Queens listed the factory address as 25 Orchard in Long Island City. A profile of the company printed in the March 20, 1904 edition of the Pittsburgh Daily Post described the business at that time. Starting from a small beginning thirteen years ago, it has grown and grown, until today it is the largest concern of its kind in America, and perhaps in the world. The main offices are in New York, and it has branches in every prominent city in the country. The Pittsburgh branch is located at 1611 Penn Avenue. 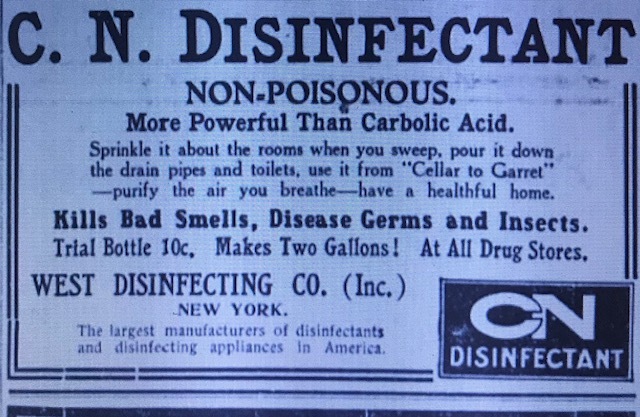 Throughout its life the West Disinfecting Company have given their attention entirely to the subject of disinfectants and disinfecting appliances, and its $50,000 chemical laboratory and works are the only works operated by such a concern in this country, and according to all the information secured the largest works in the world given over exclusively to the manufacture of such products. Every appliance made by the company is after their own design and is patented in the United States and other countries while their disinfectants and fumigants with their registered names, protected in this country and abroad, find a sale in every civilized corner of the globe. Emil Taussig served as president of the corporation until his untimely death aboard the Titanic in 1912. The following notice appeared in the April 20, 1912 edition of the New York Times. According to an April 16, 1912 story in the Boston Globe, Taussig was on board the ship with both his wife and daughter. They sailed for Europe Feb 5. He was going on a mixed business and pleasure trip on the advice of his friends, who felt he needed a rest. Although his headquarters was at Long Island City, NY, he knew every employee of the store who had been employed for a few years and would shake hands with them and call them by name when he called…He was very popular. According to the Titanic’s records, Taussig’s wife and daughter both survived. After Taussig’s death it appears that management and possibly ownership of the company transferred to Moses and Alexander J Marcuse. The 1914 NYC Copartnership and Corporation Directory listed them as president and vice president respectively. The Marcuse family remained active in the management of the company well into the 1950’s and possibly longer. The company offices remained listed in Manhattan until the mid-1920’s; first at 26 East 59th St (1900 to 1905); then 9 East 59th St (1905 to 1910); 2 East 42nd St (1911 to 1912); 12 East 42nd St (1914 to 1917) and 411 Fifth Ave (1918 to 1925). Then in 1926, it appears that the entire operation was consolidated in Queens. That year, the Brooklyn Queens Telephone Book listed both their office and factory at the Long Island City location. According to a story in the August 6, 1925 edition of the Brooklyn Daily Eagle, by this time, in addition to their New York facilities, the company maintained 38 branches in the United States and Canada. The company remained in Long Island City until the late 1970’s. The business evolved into West Sanitation Services and ultimately, in 2014, as West Industries. West Industries is currently located in Baton Rouge, Louisiana. In addition to being used in connection with the company’s disinfecting appliances, Chloro-Naptholeum was also marketed for the household as well. The November 24, 1895 Atlanta Constitution article goes on to describe it’s suggested household uses. We also have the Chloro Naptholeum in its crude state, which is used largely for ridding your house of all kinds of vermin, such as roaches, bedbugs, ants, insect bites and stings, itching, fetid feet, ringworm, for sickroom, for flushing drains, sinks, kitchen utensils and all kinds of places where there is foul air or bad odor. One gallon of this crude Chloro Naptholeum can be dissolved by using fifty parts water to one part Chloro Naptholeum. The Savannah board of health use thirty-five barrels of the crude every year, and are furnishing the citizens with it gratis. Sample bottle given free on application. An advertisement, in the July 11, 1911 edition of the (New York) Evening World described how to administer CN for various uses. Household Use – To each pail of water taken for mopping, sprinkling, scrubbing or cleaning purposes, add three tablespoonfuls of CN. It makes the cleaning easier, kills germs, destroys all odors, purifies the air, destroys ants, roaches, vermin. Bath and Toilet – Use one tablespoonful of CN for the bath on every occasion. CN is superior to ammonia, giving exquisite tonic and softening to the water. Sick Rooms – Move the patient into a well-disinfected room when possible. Remove unnecessary curtains and hangings, wash down walls and floor with CN solution or spray the wall paper with CN in the solution of one teaspoonful to a quart of water. Every house where Tuberculosis exists CN should be used daily to prevent the spread of the disease. All personal articles, eating and other utensils touched by the patient, should be carefully washed in a solution of CN. CN should be poured in the cuspidors used by the patient and should be used in all cleaning water. The advertisement also touted CN as an antiseptic for everything under the sun, including cuts, abrasions, sores, bruises, sprains, bruised hands or fingers, ulcers, abscesses, ringworm, insect bites and stings, ivy and dogwood poisoning, typhoid fever, head lice and dandruff, teeth and gum decay, sore mouth or throat, burns, scalds, sunburn, scurvy, prickly heat, chafing and catarrh. An article in the September 15, 1909 edition of “Printers Ink” described how the company capitalized on people’s fear of death and disease. They focused their advertising efforts during periods of hot weather and particularly in areas where disease epidemics were present. You have to “scare” the consumer into realizing that a disinfectant is absolutely essential for the thorough cleansing of a house and the prevention of disease. He goes on to describe their approach. 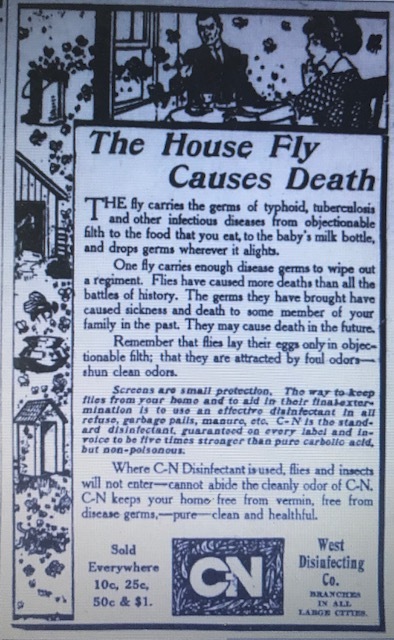 Just at present there is a serious outbreak of typhoid in New York’s great East Side and we are starting a campaign in several leading Jewish dailies to tell the masses in that section of the city how CN will minimize their danger. This advertisement which appeared the following summer in the Brooklyn Daily Eagle “hits home” with all the points Merry made in the article. The company didn’t stop with just advertising but followed it up with door to door sales. In addition to marketing CN for household use, West apparently had a Railroad and Steamship Department that marketed CN for the cleaning of public facilities. This advertisement which appeared in the April 1911 edition of “Railway and Locomotive Engineering” touted it for disinfecting and washing passenger cars and stations. If every livestock owner who has used Chloro-Naptholeum Dip would stand up and testify truly in dollars and cents how much Chloro-Naptholeum Dip has done for his stock, the total would be much larger than the figures which represent wheat crop. Chloro-Naptholeum is a money maker. It cures mange and scab. It kills lice, fleas, etc. It heals cuts, sores, wire scratches, wounds and bruises. It disinfects and destroys all unsanitary conditions in the animal quarters and the home. 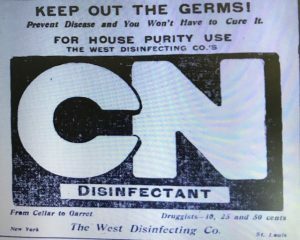 The newspaper advertisements generally fade away in the late 1930’s to early 1940’s but I’ve seen CN Disinfectant listed in Department Store advertisements as late as the late 1970’s. This April 1, 1979 advertisement for McCrory-McLellan-H.L. 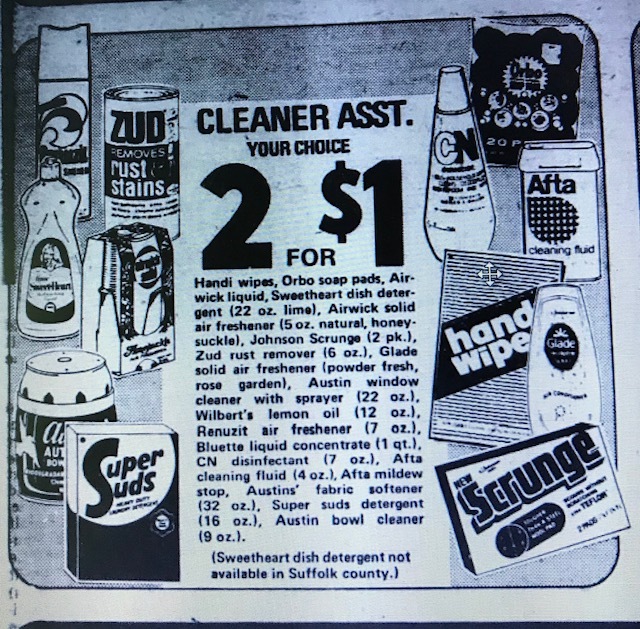 Green-Newberry advertised a 7 oz bottle (upper right) as one of several cleaners you could buy @ 2 for a dollar. The bottle I found is machine made and approximately one ounce in size. It must be what advertisements referred to as the “trial” size. This 1909 advertisement indicated that the trial size amount, when mixed with water, could make 2 gallons and at the time cost ten cents. I also found a found a four ounce bottle that accommodated a screw top. The base of this bottle is embossed with an “O” inside a box indicating it was made by the Owens Bottle Co. This most likely dates it between 1919 and 1929. The earliest address I can find for West’s Long Island City Factory is 25 Orchard (now 42-25 Orchard?). Orchard Street in Long Island City consists of one block between Jackson Avenue and the Sunnyside Rail Yards. On the east side a new multi-story glass tower was recently built. An older building on the west side of the street may still date back to the business.